Published on August 1, 2010 in Culture, General T&T, People's Partnership, Politics and Race and Identity. 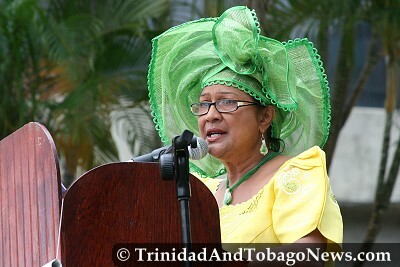 2 Comments Tags: Emancipation Day, Kamla Persad-Bissessar, Politics. Fellow citizens. Today our nation commemorates the 172nd Anniversary of Emancipation in Trinidad and Tobago. That historic act on August 1, 1838, destroyed the moral and legal basis of a system, which allowed human beings to be classified as chattel and denied the most basic human rights. Perhaps more significantly however, Emancipation set new terms for other groups coming into the society. No longer could anyone be legally defined as property. No longer could there be a denial of human rights. Emancipation set in motion a chain of events which would eventually lead to self – determination, independence and the building of an egalitarian society. While Emancipation holds special significance for the descendents of the enslaved Africans who were brought to our shores; as a nation there is much we can all learn from the observance of Emancipation Day. Emancipation presents an opportunity to celebrate triumph over oppression. It salutes the indomitable spirit to persevere in the face of tragedy. It encourages us to look into our past without fear and delve further into our history. It is a re-affirmation of identity. Today in Trinidad and Tobago we are blessed with the diverse heritage of ancestors who made tremendous sacrifices in the name of freedom. Let us continue to use the observance of Emancipation to honour their memory. Let us remember to tell their stories to every generation, so that they do not forget the origins of their parents and their fellow countrymen. Let us celebrate our history and use it as a beacon into our future. As we commemorate Emancipation Day 2010, I ask you, fellow citizens of Trinidad and Tobago, to continue to embrace the hard-won freedom bequeathed to us by our forefathers. In our diversity let us recognize our strength. There is no room for divisiveness. The prosperity and development of our beloved country depends on our capacity to look beyond our differences and build a common destiny as one united nation. Together, let us continue to work together and to draw on each other’s experiences to create a Trinidad and Tobago of which we can all be proud to call home. Happy Emancipation Day to you all, God bless you all and may God Bless our nation. THANK YOU MADAM PRIME MINISTER. You have shown your inclusiveness from the outset of your leadership. That is why I supported you and the People’s Partnership in this election. The days of race politics are over. Let us hope that soon the UNC, NJAC, TOP, COP and MSJ will evolve into a real People’s Partnership Party and give us a national party to govern our beautiful island. HAPPY EMANCIPATION DAY TO YOU TOO!!! !